When Green Lake began as a resort community nearly 150 years ago, the pace of life was determined by transportation. Visitors arrived by horse-drawn carriage, after long trips that were sometimes hot, dusty and uncomfortable. While here, they enjoyed the waters of Green Lake by rowboat or steam launch, or maybe by a canoe. Meals at the resort hotels were prepared using produce from gardens on the property, flour from the local mill, chickens from a nearby farm. Entertainment was a hayride, a lakeside picnic, a band on the lawn, a swim in the lake. Through the veil of time, it seems so peaceful and idyllic, the best place on earth. The Green Lake Area offers a wide variety of accommodation options. From full service conference centers to private home rentals, Green Lake has the lodging options to meet your needs. Stroll downtown through our unique shops or walk around in one or all eight of our parks. Big Green’s perimeter, easily encompassing over 26 miles of gorgeous wooded shoreline, is complemented with many creature-friendly restoration plantings, again due to civic activity. A boat tour of this splendid shoreline remains one of the best afternoons ever. Gardens in back of resort hotels have given way to a diversity of cuisines and country-style food at our many fine restaurants, at which local produce is still important. No matter where you are around the lake, the west end, the north shore, County K – there will be a restaurant, and the food will be tasty. Fun is fun, and all you have to do is make your choice. A picnic near the lake? We have some great parks. Swimming? The water is clean and wonderful. Boating? This lake is BIG, with plenty of room for sailing, fishing and zooming around. Like live music? Then you should visit the recently restored Thrasher Opera House, an acoustical wonder that is always presenting musical entertainment of a caliber rarely found in a small town.Almost twelve square miles of water, along with depths reaching over 200 feet, surrounded by some of the most scenic shoreline in Wisconsin (or anywhere else for that matter) equals tremendous boating. The winter season offers great oppourtunities for snowmobiling and cross-country skiing. 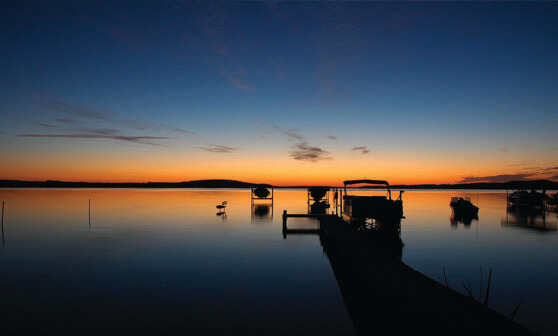 The Green Lake Area is a historic resort community for family fun and recreation in all seasons.